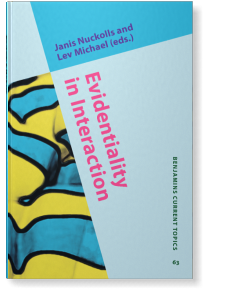 I arrived in Iquitos yesterday on the way between fieldwork on Iquito and fieldwork on Máíhɨ̃ki, and found a message from John Benjamins letting me know that Evidentiality in Interaction, a volume edited by Janis Nuckolls and me, has been published. This volume includes a Foreword by Bill Hanks, and articles on a variety of grammaticalized evidentials and evidentiality is several lesser-studied languages, including Albanian (Victor Friedman), Garrwa (Ilana Mushin), Huamalíes Quechua, Imbabura Quichua (Janis Nuckolls), and Nanti (yours truly). The chapters represent a variety of theoretical and methodological perspectives, including a CA-based chapter by Jack Sidnell.